Cuban intelligence services "have perfected the work of placing agents, that includes aggressively targeting U.S. universities under the assumption that a percentage of students will eventually move on to positions within the U.S. government that can provide access to information of use to the [Cuban intelligence service]," the five-page unclassified FBI report says. It notes that the Cubans "devote a significant amount of resources to targeting and exploiting U.S. academia." "Academia has been and remains a key target of foreign intelligence services, including the [Cuban intelligence service]," the report concludes. One recruitment method used by the Cubans is to appeal to American leftists’ ideology. "For instance, someone who is allied with communist or leftist ideology may assist the [Cuban intelligence service] because of his/her personal beliefs," the FBI report, dated Sept. 2, said. The Cubans "will actively exploit visitors to the island" and U.S. academics are targeted by a special department of the spy agency. "This department is supported by all of the counterintelligence resources the government of Cuba can marshal on the island," the report said. "Intelligence officers will come into contact with the academic travelers. They will stay in the same accommodations and participate in the activities arranged for the travelers. This clearly provides an opportunity to identify targets." In addition to collecting information and secrets, Cuban spies employ "influence operations," the FBI said. "The objective of these activities can range from portraying a specific image, usually positive, to attempting to sway policymakers into particular courses of action," the report said. 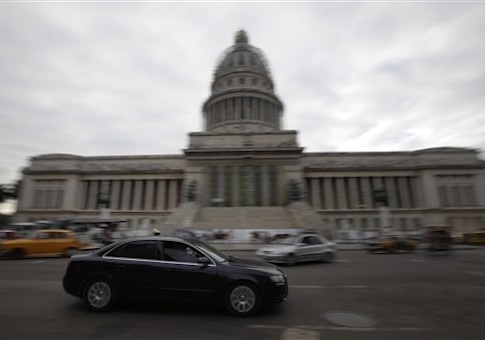 The Cubans do not limit recruitments to "clandestine agents," the report said. Other people who do not have access to secrets are co-opted as spies because of their political position or political views that can be exploited for supporting Cuban goals, either as open supporters or unwitting dupes. "Some of these individuals may not be told openly that they are working for the [Cuban intelligence service], even though it may not be too hard for them to figure out," the report said. "The relationship may openly appear to be a benign, mutually beneficial friendship." "College campuses are seen as fertile grounds for the recruitment of the ‘next generation’ of spies," Simmons said. "Cuba heavily targets the schools that train the best candidates for U.S. government jobs, like Georgetown University, Johns Hopkins University, and George Washington University." "A preferred target are ‘study abroad’ programs in Cuba, as participating students are assessed as inherently sympathetic to the Cuban revolution," Simmons said. Two other notable Cuban spies were Walter Kendall Myers, a State Department Foreign Service contractor who worked for Cuban intelligence from 1979 to 2007, and his wife Gwen Myers. They were recruited after visiting Cuba. Walter Myers was a leftist who criticized "American imperialism" in a diary entry after visiting Cuba. He held a top-secret security clearance and in 2010 was sentenced to life in prison after a conviction for spying. Cuba’s spy agencies "actively target academia to recruit agents and to support Cuban influence operations." "Unfortunately, part of what makes academic environments ideal for enhancing and sharing knowledge also can assist the efforts of foreign intelligence services to accomplish their objectives," the report concludes. "This situation is unlikely to change, but awareness of the methods used to target academia can greatly assist in neutralizing the efforts of these foreign intelligence services." The targeting of American spies takes place at schools, colleges, universities, and research institutes. "Cuban intelligence services are known to actively target the U.S. academic world for the purposes of recruiting agents, in order to both obtain useful information and conduct influence activities," the FBI said. The academic world, because of its openness and need for networking, "offers a rich array of targets attractive to foreign intelligence services," the report said, noting that U.S. government institutions draw on academia for personnel, both for entry level staffing and for consultation from established experts. An example of the recruitment effort was provided to the FBI by a "self-admitted Cuban intelligence" officer outlining how a spy is recruited at a U.S. university. "The Cuban intelligence officers located at the Cuban Mission to the United Nations in New York, New York, or the Cuban Interests Section in Washington, D.C., obtain a published work by a specific professor or student … from a university the [Cubans] are monitoring," the report said. "The letter will suggest a ‘genuine’ interest in starting a friendship or contact regarding the topic of the article," the report said. "The personal letter becomes a pretext for the Cuban intelligence officer stationed in the United States to use for initial contact with the targeted individual." "Ultimately, when the time is right, the plan will be executed and the targeted individual will be approached and formally asked to help the government of Cuba," the report said.